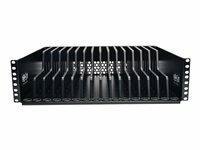 Tripp Lite's 4POSTRAILKIT1U is an adjustable rackmount shelving system that supports 1U UPS systems as well as other 1U pieces of networking or power protection equipment. 4-post expandable mounting rails offer front to rear support for equipment with 17.5" wide rectangular chassis. Rails adjust to any setting between 20.5 and 36 inches. Includes mounting hardware compatible with square-hole racks. Supports up to 150 lbs. Fixed Shelf, 1U Cantilever mount, Cold rolled steel with black finish. Required mounting hardware included. Supports up to 40 lbs. Use two shelves back to back to create a deep fixed shelf in 2POST racks. Fixed Shelf, 1U Cantilever mount, Cold rolled steel with black finish. Required mounting hardware included. Supports up to 30 lbs. Uses two shelves back to back to create a deep, fixed shelf in 2POST racks. Tripp Lite’s SRSHELF2PTM allows you to add a shelf to a 4-post rack to accommodate tower UPS systems, monitors or any other equipment that is not rackmounted. The unit supports 50 lb with an 18-in. depth. Tripp Lite's SmartRack SRSHELF4PHD accommodates tower units, monitors and other equipment. The fixed heavy-duty shelf offers 25.5 inches of shelf depth and supports up to 250lbs. SRSHELF4PHDis designed for 4 post rack mounting. Required mounting hardware is included. Tripp Lite's SmartRack Fixed Heavy-Duty Shelf SRSHELF4PHDTM accommodates tower units, monitors and other equipment. The fixed, heavy-duty shelf offers 25.5 inches of shelf depth and supports up to 250lbs. SRSHELF4PHDTM is designed for 4-post, toolless, rack mounting. 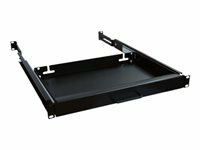 Tripp Lite's SmartRack SRSHELF4PKYBD is a sliding keyboard shelf designed for all standard 17 inch keyboards. 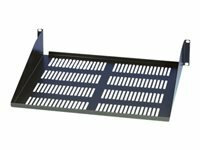 The SRSHELF4PKYBD is an extendible shelf to allow quick access to the keyboard or for storage when not in use. It is designed for 4 post rack mounting and has a 25lb weight capacity. Required mounting hardware is included. Key Features Sliding keyboard shelf designed for all standard 17 inch keyboards. 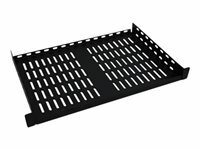 Tripp Lite's SmartRack SRSHELF4PSL is a standard sliding shelf for installation in rack cabinets. The SRSHELF4PSL has a 28.3 in. / 72cm depth (29.5 in. / 74.9cm including handle) and can support up to 50lbs. This fully extendable shelf can accommodate tower units, monitors and other equipment. It is designed for 4 post rack mounting and the required mounting hardware is included. 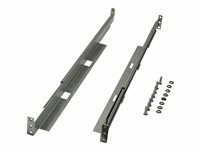 Expandable mounting rails supports installation in racks with front to rear rail distances between 28 in. / 71cm minimum and 46 in. / 117cm maximum. 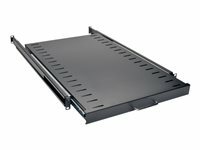 Tripp Lite's SmartRack SRSHELF4PSLHD is a heavy duty sliding shelf for installation in rack cabinets. The SRSHELF4PSLHD has a 28.3 in. / 72 cm depth (29.5 in. / 74.9cm including handle) and can support up to 200lbs. 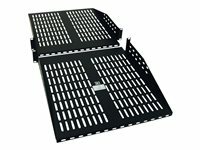 This fully extendible shelf can accommodate tower units, monitors and other equipment. It is designed for 4 post rack mounting and the required mounting hardware is included. Expandable mounting rails supports installation in racks with front to rear rail distances between 28 in. / 71cm minimum and 46 in. / 117cm maximum. 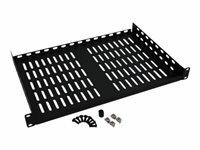 The SR16SHELF 3U Rack-Mount Configurable Storage Shelf securely stores up to 16 personal electronic devices in your wall-mount or floor rack enclosure. Ideal for storing tablets, laptops, Chromebooks and other similar devices, the SR16SHELF comes preset with 4/5-inch spacing between its plastic dividers. However, the 15 dividers can easily be removed and adjusted to fit your devices. Compatible with all EIA-compliant 19-inch wall-mount and floor rack enclosures, the SR16SHELF is covered in non-scuff paint designed to resist scratches. The devices’ charging cables pass through ports with rubber grommets that hold the cable in place and prevent clutter and tangles. All mounting hardware included. Mounts into 3U of rack space, but may require additional rack space depending on the size of the devices being stored.